Summary Single band N router with 10/100 ports and 5 each IPsec & PPTP tunnels based on a Broadcom N Router SoC. If you thought Cisco had established the low end of its RV small biz router line with the RV120W that Doug Reid looked at back in January, you'd be wrong. 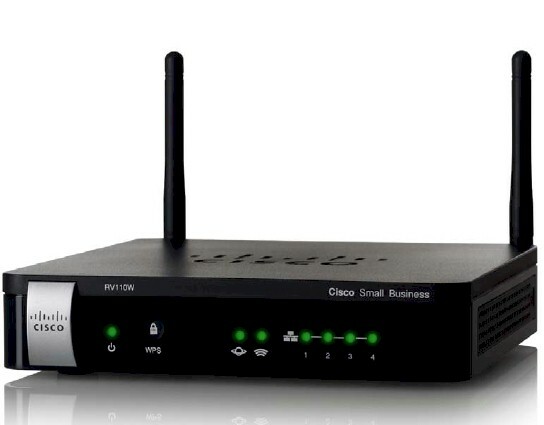 It seems that Cisco wants to extend its reach to the really small business router buyer and for that, they came up with the RV110W Wireless-N VPN Firewall. At first blush, the 110W's feature set looks similar enough to the 120W's that you might wonder how Cisco is managing to sell the 110W for as low as $85 vs. $136. But all will be revealed shortly, dear reader. In the meantime, I'll just say that you get what you pay for. The RV110W is not cut from the same cloth as its other RV siblings. The emphasis on low cost starts with the all-plastic black enclosure, whose rounded-corner 6" square footprint might bring to mind an Apple Airport Extreme - Darth Vader edition. But a more appropriate comparison would be that it's a slightly thinner version of the RV220W, with a bit of silvery bling on the front panel. The two exernal antennae are movable, but can't be upgraded. And even with a cost-reduced focus, Cisco has thoughfully added a security lock slot on the side and wall / ceiling mounting slots on the bottom. Cisco didn't scrimp on indicators as Figure 1 shows. They even included a hardware WPS button prominently on the front panel vs. the software only buttons on the more expensive RVs. The rear callouts in Figure 2 don't identify the single WAN and four switch LAN ports as 10/100, not Gigabit. Cisco must believe low cost (or higher margins) is more important than supporting faster LAN transfers, since none of its RV series, including the more heavy-lifting RV0XX series include Gigabit Ethernet. Once you get inside the 110W, you understand that it's a very different beast. Unlike the other RV's, it's not powered by a Cavium processor. No, at the heart of the 110W beats a lowly Broadcom BCM5357 router SoC, the very same beastie that powers the two lowest-ranking members of the Linksys E series consumer router line. So the RV110W's dirty little secret is that, at least hardware-wise, it has more in common with its E1200 and E1500 consumer cousins than with its own small-biz siblings. Actually, of the two, the 110W is more like the E1500, since it has two SiGE 2.4 GHz power amplifiers under the RF shield you see in Figure 3. There's a bit clearer shot of the board in the gallery if you want it. The 110W differs from the E1500 in an important way, however, in that it has 64 MB and 16 MB of RAM and flash, repspectively, vs. the E1500's 32 MB / 8 MB. As you'll see shortly, the 110W puts that extra memory to good use.